The graduating class of 2015 who landed full-time jobs were hired on a median monthly salary of $2,100, compared with $2,000 in 2013 and 2014. The monthly pay of graduates who had completed national service (NS) after finishing school in 2012 also moved up by $100 to $2,500. The survey, which involved 10,513 graduates from last year and 4,876 post-NS graduates who completed their diploma course in 2012, also compared the pay levels of polytechnic graduates across different courses. Those with diplomas in built environment, engineering and maritime, and health sciences were the best paid. 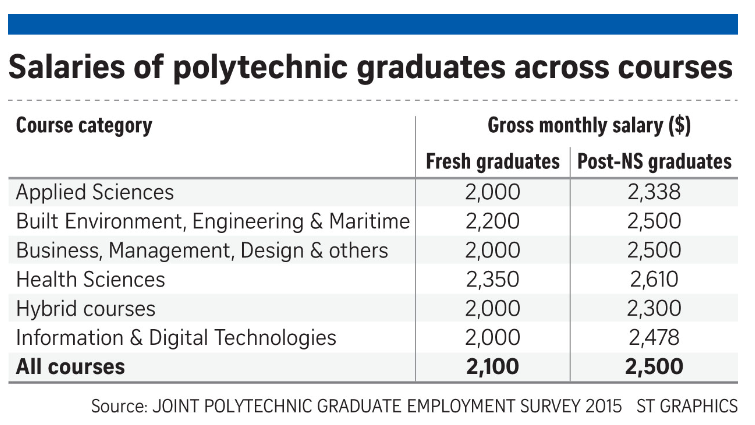 Demand for Polytechnic graduates has consistently been strong. This entry was posted on January 10, 2017 at 12:12 pm and is filed under Singapore. You can follow any responses to this entry through the RSS 2.0 feed. You can leave a response, or trackback from your own site.